This week's podcast about 3-D gaming had me a bit worried that the technology is focused too narrowly on aesthetics. While it would be neat to witness the odd fireball hurtle towards us through the screen, 3-D seems focused on changing a game's visual experience rather than the systemic experience. One problem I see with 3-D is the tendency to acclimate to whatever is on screen. Visuals are relative: what looked great in the 1980s looks crude today, and what looks great today will be laughable in the decades to come. Even during the course of a single game, it is easy to grow jaded in even the most wonderful environments. The initial scenes of Bioshock were breathtaking, but familiarity breeds indifference; the decayed city is still as tragically beautiful at the end of the game as it was at the beginning, we just start taking it for granted. How long will it take before 3-D becomes hum-drum? As someone predisposed to favor mechanics and dynamics over visuals, I already have a strange relationship with graphics. With nearly every game I play, my brain starts to strip the graphical detail off of the on-screen images in order to focus more clearly on the story being told by the game's rules. 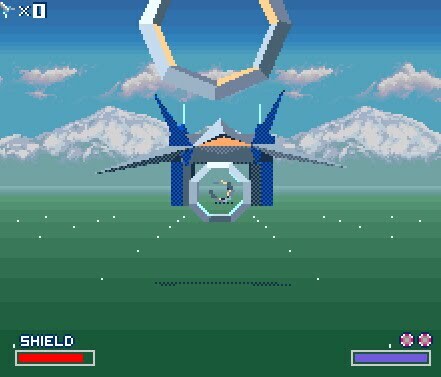 I still enjoy a visual treat, but most of the time things start looking a bit like the original Star Fox: intricate geometry is distilled into simple shapes, color and textures are flattened and homogenized. It is a land where function reigns supreme, where the graphics have little bearing on my actions. Of course, it is easy to draw a stark line between the gameplay and graphics in theory. In practice, it becomes clear how aesthetics can subtly shape even the most utilitarian of players. As a thought experiment, I came up with three relatively current examples of games who used their looks to change my actions. 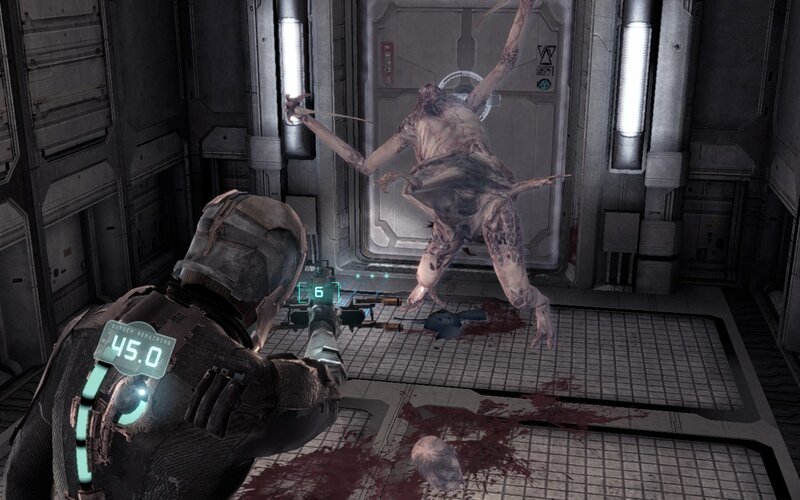 The line between the ornamental and practical is almost fully dismantled in Dead Space. In terms of displaying inventory, health, and other statistics, most games break the fourth wall unapologetically. Instead of placing a layer of numbers and menus over the action, Dead Space makes them a part of the world. Isaac's health is an armor gauge on his suit, his ammo level is displayed holographically on his gun, and a menu is projected into a the world rather than on a pause screen. By making the HUD a diegetic component of the game world, I was constantly aware of the small details of my surroundings. Keeping track of health and ammo in a hectic battle took more than simply glancing at the bottom of the screen. A raging fire, a charging enemy, or too many quick turns would obscure crucial details that other games would never hide. I quickly learned to pay attention to avoid wandering into a situation that could potentially hamper my ability to notice the small details on Isaac's gear. On a systemic level, Resident Evil 5 and Dead Space are very similar, but because Dead Space intertwines its aesthetics into its gameplay, I ended up playing the two games quite differently. The aesthetic influence on gameplay in Mirror's Edge begins to venture into less quantifiable territory. 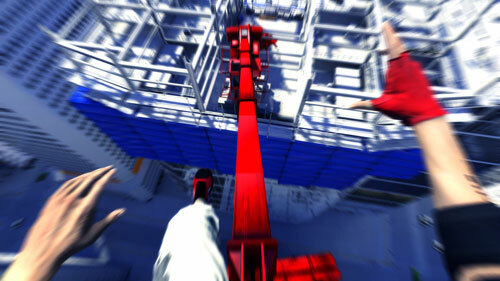 In the simplest sense, the goal in any Mirror's Edge stage is to get to the end. The levels are deceptively varied, and success can be achieved through following a number of paths. However, the way it looks when Faith is running makes it almost impossible to take things slow and steady. Mirror's Edge reminds me just how fun it is to run as fast as you can. Small glimpses of Faith's hands pumping up and down, the subtle blur that engulfs your peripheral vision, and the sense that time is slowing down when she leaps across the gaps between buildings are all graphical flourishes that affected how I approached the game. Sometimes I would take a route I knew was more dangerous simply because I wanted see what running through a gauntlet of soldiers would look like. Stealthily plodding through a level or using a firearm are both legitimate, effective ways of using the game's rules to achieve success. However, the game's artistic style made it seem like flying high was the real way to play, even if it did result in some ill-advised maneuvers. Instead of scrubbing the game of its exhilarating graphical detail, I wanted to savor it. Like Mirror's Edge, Batman's aesthetic influence over gameplay is one that capitalizes on an intangible sense of how to "properly" play the game. In Batman's case, the character and his world tap into decades of cultural authority to compel me to play in a specific way. While I have not played through the full game, I am sure that when I do, I will limit the amount of time I spend in "detective mode." 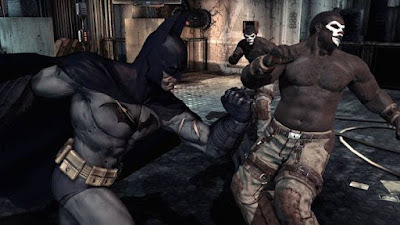 Being able to use a souped-up version of Batman's cowl to see through walls, scout out grappling points, and look for shortcuts is logical in terms of successfully clearing stages. However, doing so plunges the screen into a neon purple, blue, and orange that detracts from the Batman universe's quintessential Gothic look. Detective mode also seems out of character for my preferred version of Batman. While gadgets have always been part of his arsenal, something about a real-time augmented reality display seems a little too high tech for the Dark Knight. Unlike so many other superheroes, Batman is human, and so I consciously change my play style to accommodate a visual scheme that reminds me of this fact. So perhaps the impact of 3-D is not as superficial as I fear it may be? While 3-D may not change the fundamental rules of many established genres, it undoubtedly has the capability of inspiring us to play differently within those structures. If the aforementioned examples are any indication, graphics that may initially seem like a veneer can subtly take root in a game's mechanical foundation. After all, we call them "video" games for a reason. 3D can be a distraction or something benign, sure. As is the case with most new tools, though, there is a learning curve, and it takes a while for devs to get a handle on things without being caught up in the "ooh, shiny" aspects. 3D is a tool, nothing more. It was stupid for a long time in movies, and it will likely be stupid for a while in games. It doesn't have to be, and it's not innately bad, but, like pixel shaders, shiny surfaces and polygons before them, it will likely take a while for 3D in games to be something that complements the design rather than competing with it or being a mere gimmick. These games are indeed good examples to look to, as the presentation and the mechanics work well together. One thing I keep coming back to is this, though: Does the 3D serve as a useful game mechanic, or is it just fluff? The "Avatar" movie, for example, plays perfectly fine without the neato-skeeto 3D, and the 3D just augments what is already there. It's not a gimmick, it's a natural extension of the presentation. With games, there's always the temptation to make 3D a game mechanic, and we need to be really careful about how we do so. Agreed. I imagine that it will take someone like Shigeru Miyamoto or Will Wright to really approach the technology from a design perspective instead of just an ornamental one.